Sandra Harber of Urban Rebel Designs is a Premier Retailer for Dixie Belle Products! Check out her video of this tutorial here! Live demo of Little Red Christmas Trucks! Sandra bought these metal truck from a local craft store with a coupon, you can always find these on sale! She started out with a base color! 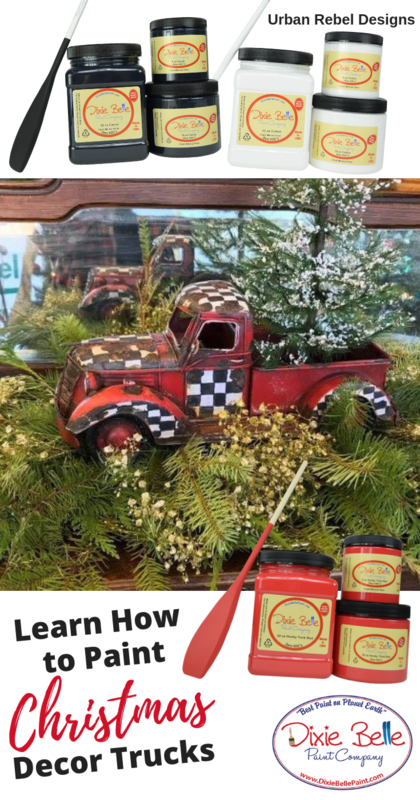 The Dixie Belle Colors used were Honky Tonk Red and Evergreen, the perfect Christmas colors! For the details Sandra used a sponge to paint the polka dots and a small liner brush for painting the stripes, she used Dixie Belle Paint new colors Cotton, and Caviar! Base coat the truck with Evergreen for John Deer Lovers, they will adore this project! 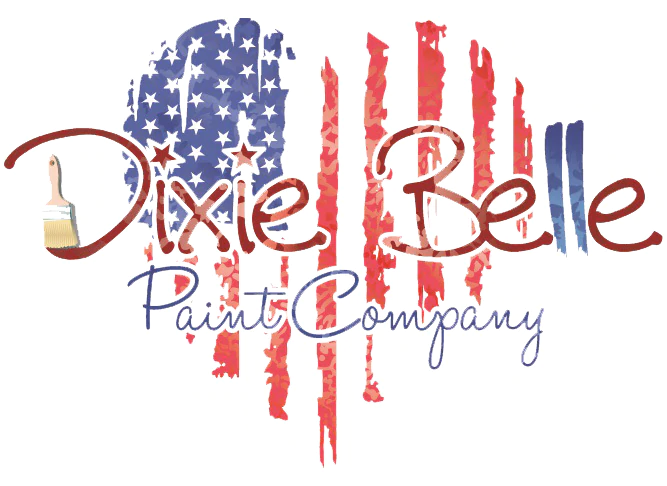 It doesn’t take a whole lot of paint; Dixie Belle goes twice as far as regular acrylic paint! But always plan on using 2 coats with White or Yellows. Its just paint, you can fix it, you can change it. You hate it? Paint over it! We are using Iron Patina Paint for some rusty spots on our truck! Patina needs a base coat to adhere to metal surfaces. Prime Start is a product that you can use as the primer for Patina to adhere to. You don’t need the primer unless you are painting on Metal. Paint one layer of Patina, let it dry. Paint a second coat of Patina, while the second coat of Patina is wet you will spray it with the Green Activating Spray which will create a Rust, in a reddish orange yellow color. This is so fun! You can find a beautiful silver colored tray at the thrift store or at a yard sale to place your truck on! 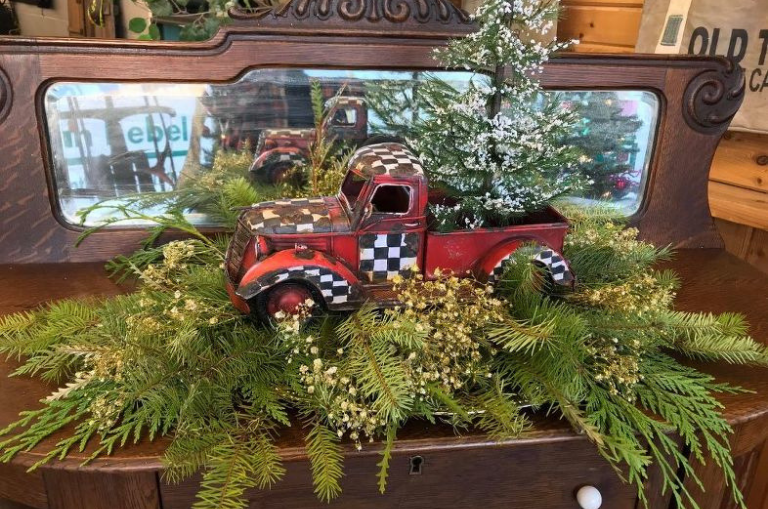 The truck sits on top some lush greenery purchased pre-cut from the local grocery store that she re-cut to size, as well she added glittered baby’s breath! She purchased a mini Christmas tree from the craft store to place in the back of the truck. Gold or Silver colored candle holders placed in the back of the truck makes a beautiful glow to your centerpiece. Dixie Belle Paint Company was live. #LIVE with Tracey of TraceysFancy for Part 2 ✌🏻 of the YELLOW boho bed! Let’s add stripes and a furniture transfer and see where that takes us! And lastly.....you may want to check this out on Instagram FAST as it’s happening later tonight!!! Yes you can use tape or stencil for harlequin! These transfers are ReDesign with Prima! Can’t wait until Sunday morning!!! Love that!!! Scrubby Soaps are amazing! Great to clean brushes! Tracey has a great tip to burnish the edges! Farmhouse green and ReDesign products are featured on this! This is a ReDesign by Prima transfer! Follow Tracey on Facebook at TraceysFancy! ReDesign by Prima transfers can also be purchased on our website! Visit TraceysFancy on FB to learn more about her diet!! !